The Syrian city of Hama has come under heavy bombardment by tanks on the second day of a crackdown on anti-government protesters, activists say. The shelling intensified in the evening, as people were attending mosques for prayers to mark the end of the first day of Ramadan. Security forces killed scores of people in the city on Sunday. Meanwhile, the UN Security Council is due to hold an emergency meeting to discuss the situation. Activists say about 130 people died across the country on Sunday, making it one of the bloodiest days since the uprising against President Bashar al-Assad began in mid-March. Syrians start fasting for the month of Ramadan more concerned and uncertain than ever about what will happen next. If the assault on Hama on Sunday was meant to scare protesters off the streets, it has not succeeded. Many protests took place in Damascus after evening prayer on Sunday in support of the people of Hama. They were met, as usual, with tear gas and gunfire. The two sides in this crisis seem to be determined to continue with their strategies; protesters will keep on taking to the streets and the regime will continue to use violence against them. In the current pattern, it is difficult to imagine any solution unless there is an end to government violence. The BBC's Jim Muir, in Beirut, says Hama still seems to be largely under the control of its own inhabitants rather than the government. Tanks and troops which had tried to take control of the city on Sunday, withdrew to the outskirts later but then seemed to be pushing ahead again on Monday, he adds. Some families in Hama have buried their dead in parks or in the gardens of their own homes because they are afraid to go out, the BBC's Lina Sinjab in the capital Damascus says. Residents said the shelling continued throughout the day on Monday, with a hospital among the buildings coming under attack. Activists said troops were firing machine guns at worshippers heading out to mosques. Four people were reported to have been killed. Resident Omar al-Habal told the BBC that people were building barricades and burning tyres to keep troops out. He said there had been shooting in Hama "from all sides by all types of weapons". "Bombs and heavy artillery, machine guns... and all around the city the people on the barricades light the tyres to protect the city," he said. There have also been reports of intense shooting in the eastern city of Deir al-Zour, and of tanks storming the eastern town of Abu Kamal, on the border with Iraq, which activists say has been under siege for about two weeks. International journalists have been denied access to Syria and it is not possible to verify accounts by witnesses and activists. Government attempts to crush continuing protests across Syria have brought strong international condemnation, with Germany and Italy calling for an urgent meeting of the UN Security Council. Germany is currently a member of the council. UN officials said an emergency meeting of the security council would be held behind closed doors at about 17:00 in New York (21:00 GMT) on Monday. Some security council members including Russia and China have so far opposed resolutions condemning Damascus. However, Russia on Monday called for an end to "repressions" in Syria. "The use of force against both peaceful civilians and representatives of state structures is unacceptable and should be stopped immediately," the foreign ministry said in a statement. Analysts say it is Moscow's strongest criticism yet of President Assad. Earlier, US President Barack Obama said he was "appalled" by the Syrian government's use of brutality. EU foreign policy chief Catherine Ashton urged the UN Security Council to take a "clear stand on the need to end the violence". In a statement on Monday, she also announced further EU sanctions against members of the Syrian regime. 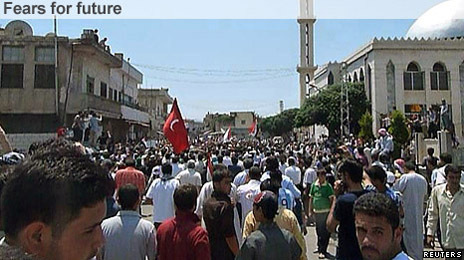 Hama - a bastion of dissidence - occupies a significant place in the history of modern Syria. In 1982, then-President Hafez al-Assad, father of Bashar, sent in troops to quell an uprising by the Sunni opposition Muslim Brotherhood. Tens of thousands were killed and the town flattened. 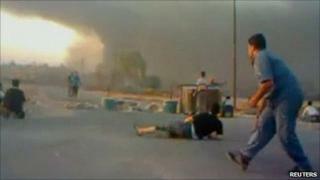 The city, with a population of 800,000, has seen some of the biggest protests and worst violence in Syria's 2011 protests. It was slow to join in, but has now become one of the main focuses of the revolt. In an interview with the BBC on Monday, UK Foreign Secretary William Hague called for stronger international pressure on Syria. "We do want to see additional sanctions. We want to see stronger international pressure all round. Of course, to be effective, that can't just be pressure from Western nations, that includes from Arab nations, it includes from Turkey," Mr Hague said. Seeking military action against Syria, even with UN authority, was "not a remote possibility", he added. On Monday, President Assad praised the military for "foiling the enemies" of the state, the official news agency reported. The Syrian government has promised reforms but says its troops are being attacked by "armed gangs" who are backed by unspecified foreign powers. Syria's anti-government protests, inspired by events in Tunisia and Egypt, first erupted in mid-March after the arrest of a group of teenagers who spray-painted a revolutionary slogan on a wall. The protests soon spread, and the UN says 3,500 people have died in the turmoil - mainly protestors but also members of Syria's security forces - while thousands more have been injured. Although the arrest of the teenagers in the southern city of Deraa first prompted people to take to the streets, unrest has since spread to other areas, including Hama, Homs, Latakia, Jisr al-Shughour and Baniyas. Demonstrators are demanding greater freedom, an end to corruption, and, increasingly, the ousting of President Bashar al-Assad. The government has responded to the protests with overwhelming military force, sending tanks and troops into towns and cities. Amateur video footage shows tanks and snipers firing on unarmed protesters. There may have been an armed element to the uprising from its early days and army deserters have formed the Free Syrian Army. Some of the bloodiest events have taken place in the northern town of Jisr al-Shughour. In early June, officials claimed 120 security personnel were killed by armed gangs, however protesters said the dead were shot by troops for refusing to kill demonstrators. As the military moved to take control of the town, thousands fled to neighbouring Turkey, taking refuge in camps. Although the major cities of Damascus and Aleppo have seen pockets of unrest and some protests, it has not been widespread - due partly to a heavy security presence. There have been rallies in the capital - one with an enormous Syrian flag - in support of President Assad, who still receives the backing of many in Syria's middle class, business elite and minority groups. The Assad family has been in power for 40 years, with Bashar al-Assad inheriting office in 2000. The president has opened up the economy, but has continued to jail critics and control the media. He is from the minority Alawite sect - an offshoot of Shia Islam - but the country's 20 million people are mainly Sunni. The biggest protests have been in Sunni-majority areas. The uprising has cost 3,500 lives, according to the UN and Jordan's King Abdullah says that President Assad should now step down. The Arab League has suspended Syria's membership and voted for sanctions. The EU has frozen the assets of Syrian officials, placed an arms embargo on Syria and banned imports of its oil. But fears remain of Syria collapsing into civil war.